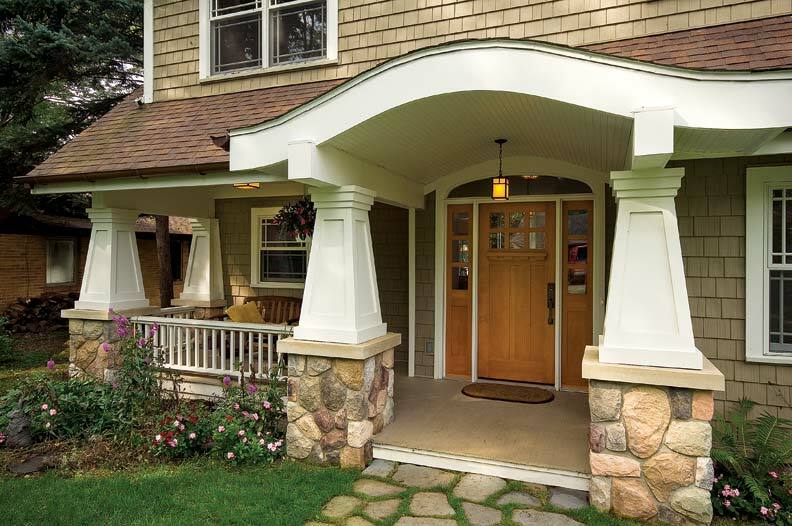 An open porch, square tapered columns, and a stone foundation create a historical Craftsman feel for this new home in Michigan. 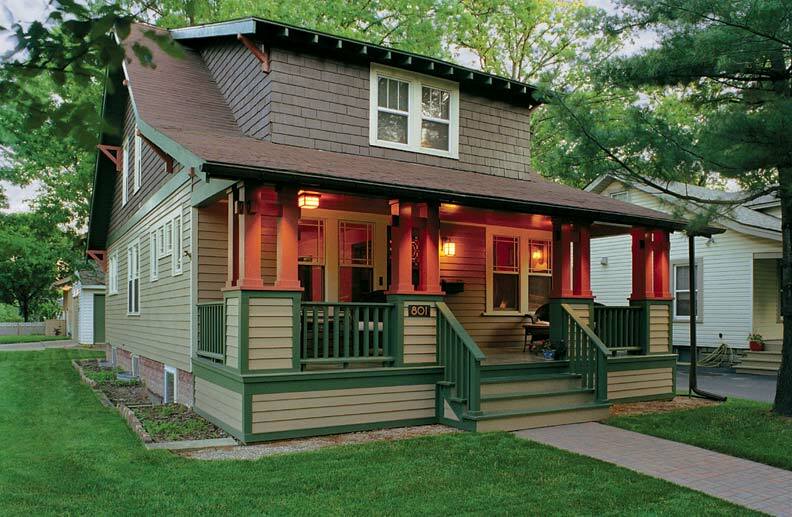 Horizontal lines, open porches, square tapered columns, deep overhanging eaves, oversized brackets, and prominent stone chimneys are just a few of the characteristics of the Arts & Crafts bungalow made popular in the early part of the twentieth century in the United States. A truly iconic American house type, the bungalow is as relevant today as it was more than 100 years ago. The design, always accommodating climate and location, is still popping up around the country. And it was this style that Carol Stevens gravitated to when she decided to remodel a 1950s cottage on Gull Lake in Kalamazoo, Michigan. 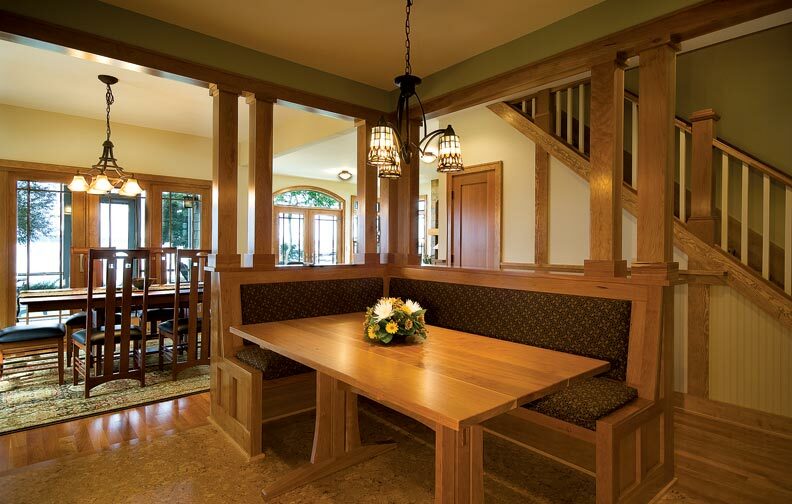 A built-in banquette offers space-saving dining. Clustered columns separate the kitchen, dining room, and hall while keeping the rooms open and airy. Views of the lake can be enjoyed from the home from almost every room. 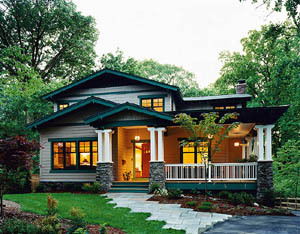 The front of the house, with a quintessential open porch and an eyebrow detail over the steps, presents a welcoming face to the street and offers a connection to the community. “The eyebrow is a bit of a departure from the historical Craftsman form and updates the look,” remarks Klement. Another money saver was to use wood for all the trim pieces and columns but a synthetic shingle-and-clapboard siding. “This kept costs down tremendously,” states Klement. 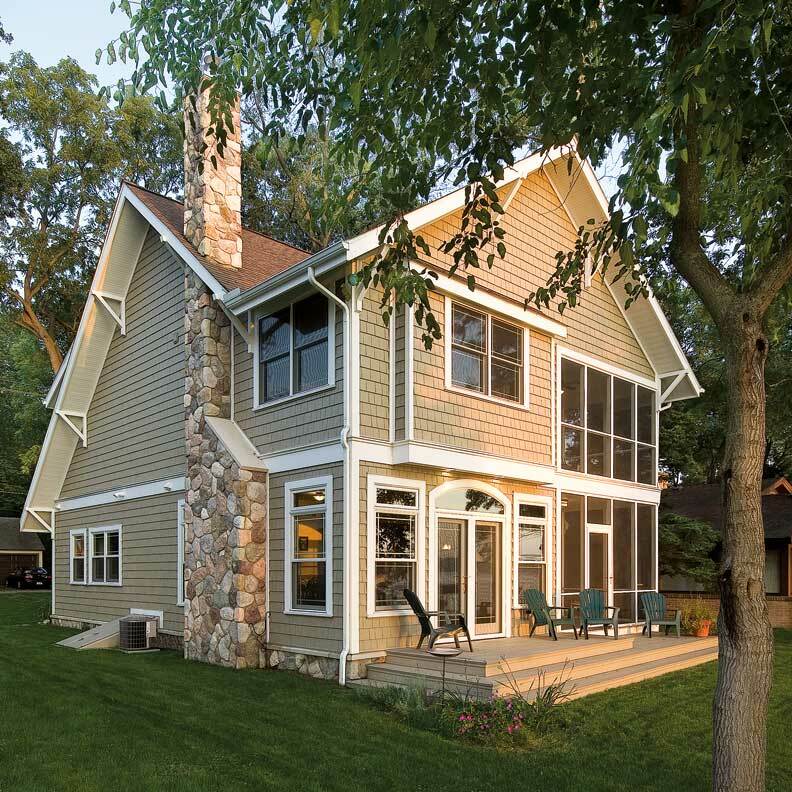 “The siding is also virtually maintenance-free.” Another telltale sign that this is a Craftsman bungalow is the stonework of the foundation, porch, and chimney. “We chose to use an architectural stone veneer, which is a less expansive material than real stone,” says Klement. The lake-facing side of the home offers a mix of contemporary and historical architectural elements. A screened sitting porch on the first floor and a sleeping porch above connect the interiors with nature. The second-story sleeping porch, adjacent to a guest bedroom, resulted more from a desire to commune with the outdoors than from a choice to use a historical element. The idea was to allow the homeowner to feel as if she were camping out, enjoying the gentle breezes off the lake. 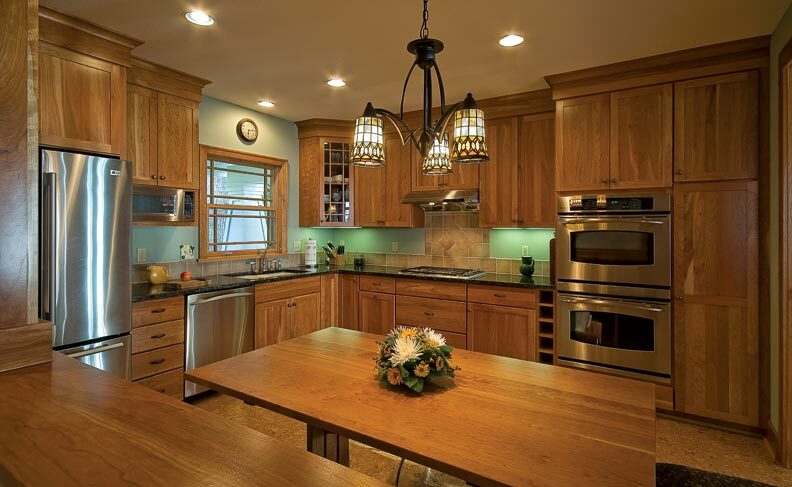 The kitchen offers ample cooking and prep space. 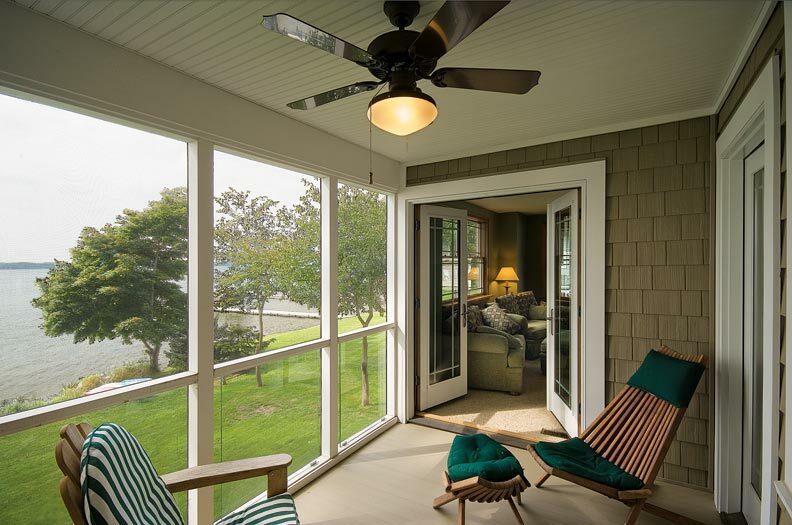 A low open deck, accessed through a set of French doors off the living room, is another way the home stays connected with nature. The second floor is designed with a bump-out with a shed roof to add architectural interest to the façade as well as add a bit of additional floor space in the bedroom. 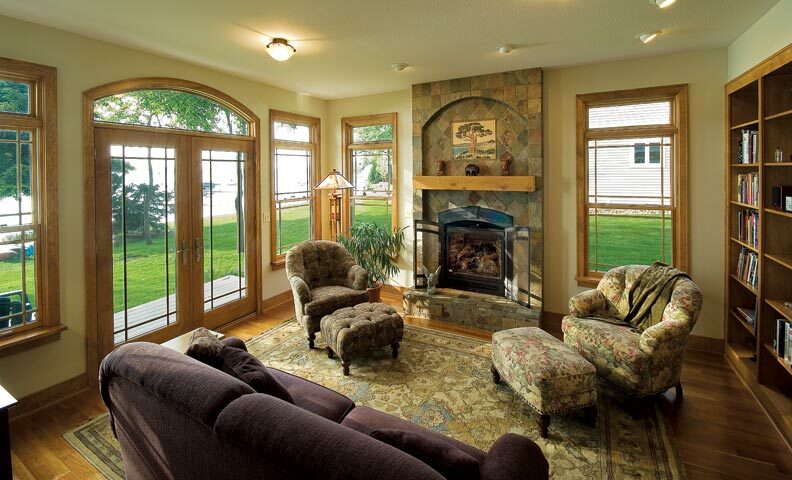 Craftsman touches include grid patterns in the windows and reproduction Arts & Crafts tiles above the fireplace. Klement also minimized halls and corridors. “We did create distinct spaces, but did this without impeding enclosures or views.” For instance, the kitchen has a built-in banquette, but instead of creating a wall separating the bench and the hall, Klement designed square clustered columns that act as a colonnade so you can see through the spaces without the view being blocked by any enclosures. “The main floor has minimal hall space, and the one hall that does exist is open and purely for circulation,” points out Klement. Taking cues from naval architecture, Klement used every inch of space imaginable in the home. A small powder room is tucked under the stairwell; a built-in bookshelf in the living room offers plenty of storage for books. A built-in banquette in the kitchen is also a space-saver. The interior woodwork creates interest and deep shadow lines; the clients chose a cherry wood in a natural finish for the interiors. Other Craftsman touches include the inlay of Arts & Crafts reproduction tiles over the mantel, and window fenestration offers rectilinear forms in the Craftsman style. Screened and sleeping porches allow Stevens to connect with nature on both levels of the home. Architect Dale Stewart brings this historical style to the 'burbs.